“You’re cheating!” my husband said as he turned the corner. “So, what,” I half-heartedly mumbled as I brushed past him in the hallway. The window on my computer screen was open and there it was…all exposed for the world to see (and hear.) I WAS BUSTED. There was no denying it and if you know me, I wouldn’t bother with trying to make excuses. It felt good, so I threw commonsense out the window and continued to listen to Christmas music a mere two days after the Fourth of July. It was not my intention to get into a full Christmas groove. 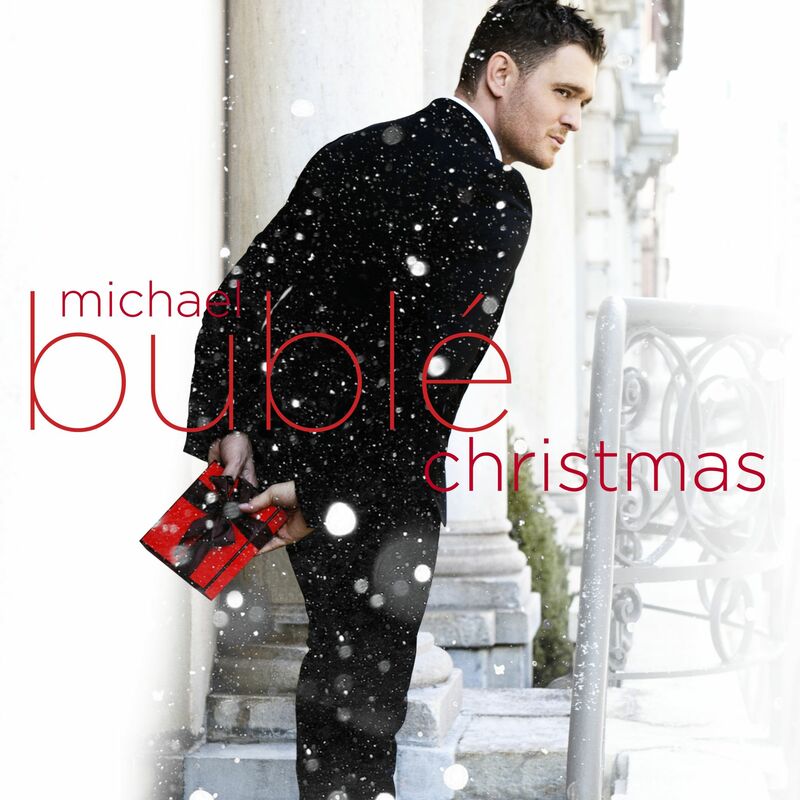 In fact, I was listening to Justin Bieber’s “Boyfriend” for the 80th time with my seven-year old daughter when I caught a glimpse of Michael Buble’s Christmas CD icon out of the corner of my eye. The snowy scene, the gift-bearing crooner, the joyful feeling that conjures up the holidays. So before Bieber could promise his girlfriend more fondue I double clicked and the familiar melody began…it’s beginning to look a lot like Christmas…. I had only intended to hear the first song, a Christmas-junkie’s first mistake. I truly love Christmas. And I’m going to say it (though many of you will not believe me) I truly love Christmas and it has NOTHING to do with the presents. Trying to pinpoint what I love most about the Christmas holiday is difficult. I love the cooler weather (correction, “colder” temps…I live in the Midwest), the decorations, the busyness (although I regularly complain about that part), the shopping, the planning, the cookie baking and especially the music. It’s the music that really sets the tone, puts that special something in the atmosphere and makes many of the awful parts of the holiday season (and we know there are some truly awful parts) much more festive! Of course, these are just the secular part of the holiday…when I start thinking about the birth of our Savior, well it just makes the season so much more meaningful and special…but that’s another blog. So back to my kitchen and Christmas music in July…. Somewhere in the middle of song two (Santa Claus is Coming to Town) I started daydreaming about putting up the Santa collection and wondering if I should continue to make it the focal point of the living room. Then, early into song three (Jingle Bells) I began thinking about my son’s winter coat and how he’s growing like a weed and whether or not we need to plan to buy him a new one. Next, White Christmas turned my thoughts to looking at the calendar and finding out what day of the week Christmas was on this year. By the time I hit the chorus of All I Want for Christmas is You I started thinking that I should start my shopping early this year, like maybe in August or September…no wait, we have school shopping to do… my thoughts started racing. Several songs later I ended up at Blue Christmas and began to realize that I wasn’t really enjoying the music any more, instead I had actually started a mental list of all the things that I had to get done before Christmas. My mind was a blur of plans and preparations…a “to do” list was starting to form. I was already wondering how we were going to balance church programs and school holiday events… and basketball practice? YIKES! Believe it or not, but Christmas panic was actually attacking me in JULY. Breathe, breathe, breathe…. Michael Buble’s personal Christmas greeting belted out from the computer speakers. My Christmas daze was over. Although I played the whole CD, I’m fairly certain that I only heard half the songs. And it dawned on me…there is a defined Christmas season and there’s no way it can begin as early as July! I don’t think I could handle it if it did. Suddenly, the warm July temps seemed a lot more appropriate, a schedule jam-packed with little league baseball sounded just right, and a couple more months of wearing flip-flops and sandals seemed to fit me to a tee. No sense in rushing a good thing. Christmas could wait. I shut down the computer for the evening with only the faintest brainworm of I’ll Be Home for Christmas running through my head. I still have to get through all the summer birthdays, the first day of school, Labor Day, and finally Halloween…the official start of the holiday season, right? I won’t claim to be a big time Beatles fan. Don’t get me wrong. They’re GREAT! I love a lot of their songs and if I was around during their heyday, I would probably be among the throngs of screaming girls hanging on their every word, buying posters and otherwise going ga-ga for them. So, obviously, I think a lot of the Beatles. Still, I don’t own any of their albums or CDs and I don’t know all the lyrics to any one of their songs. But, there is one ditty that I just adore–Hey Jude! I probably first heard the song as a kid in passing. I imagine that I came across it in somebody’s parent’s album stash. Still, not much of a blip on my music radar. My next encounter with the Beatles was fleeting. I’m sure I saw someone on campus wearing a t-shirt and thought to myself, “Oh, yeah. I like the Beatles…cool.” I’d hum a few songs here and there. And at one point I thought about buying one of their CD’s at the local music store, but the new SneakerPimps release won out…a consequence of being a broke college kid and having to make tough financial choices. So the Beatles went by the wayside and I moved on with my life, but this was college and some things never die. The Beatles resurfaced again a little later when I became acquainted with college radio. You know how it goes, one DJ likes 80s Punk, someone else likes Big Band, there’s always a girl whose show revolves around man-hating, angsty girl bands (one of my faves), and the list goes on and on. Basically, anyone can get a show. Thus one mild-manner fellow played the Beatles and I loved it. For the most part it had loads of elements to it—fun and poppy early stuff, catchy numbers that quickly become brainworms, ridiculous karaoke-type songs (Yellow Submarine anyone? ), and later more thoughtful ballads. Who couldn’t find something to love in such a varied set! All of this brings me to Hey Jude. Senior year in college. Just when you’ve gotten used to the college lifestyle (and all the perks that come with it), you suddenly realize that all good things come to an end. As the cliché goes, “there’s a reason and season for everything under the sun.” It was inevitable. And while most of my crew would extend their college plan an extra semester or go on to work on a master’s degree, I was on course to graduate in the spring. It was all part of my super strict, no room for errors, by the book, four-year college plan. Sure, many tried to get me to stay in our little bubble…”Go an extra semester, minor in Spanish, go to grad school,” they all said. But as much as I loved them and loved that life, I knew my time was done. So in January while celebrating a birthday at our favorite hangout, Louise’s Bar Downtown, I strolled over to the jukebox to pick out the last song of the night. I had stood at this jukebox before. I knew the song choices and for nearly two years I had always picked the same song, “Breaking Up is Hard to Do” by Neil Sedaka…well worth the quarters I sunk into the machine. (SIDEBAR: I really do like that song. It reminds me of peanut butter milk shakes, holding hands, and simpler times. However, amongst a college crowd, it always garnered groans and head turns…which made the song extra fun for me!) But this song was going to be THE last song of the night. It had to be special. We were here to celebrate a dear friend’s birthday, the start of my last semester in college and CLOSE DOWN THE BAR. Obviously, the pressure was on! So I dropped two quarters and selected Hey Jude and never looked back. That semester whenever we all got together, it had to be Louise’s, we had to CLOSE DOWN THE BAR, and we had to listen to Hey Jude. It became for us the exclamation point at the end the evening. It had to be the song we sang or hummed walking out the door. It had to carry us home. And it always did. On graduation night we ended up at Louise’s–where else, right? My dear friend (and roommate) had a roll of quarters and waltzed me over to the jukebox. She said that tonight we were CLOSING DOWN THE BAR with $10 worth of Hey Jude. I couldn’t think of a better parting gift. We made the selections and walked away. About an hour into the repetitive Hey Jude track, the bartender kicked us out. Apparently, the crowd was a little upset at what they considered our buzz kill music. We were escorted out that night (the first and last time that has ever happened to me), but we had the biggest grins on our faces. I left town two days later to a new job, a new town and a new state. There I found new friends, my future husband, and a reawakening to faith. Hey Jude and I would occasionally cross paths during the years and my mind would wander back to those days. 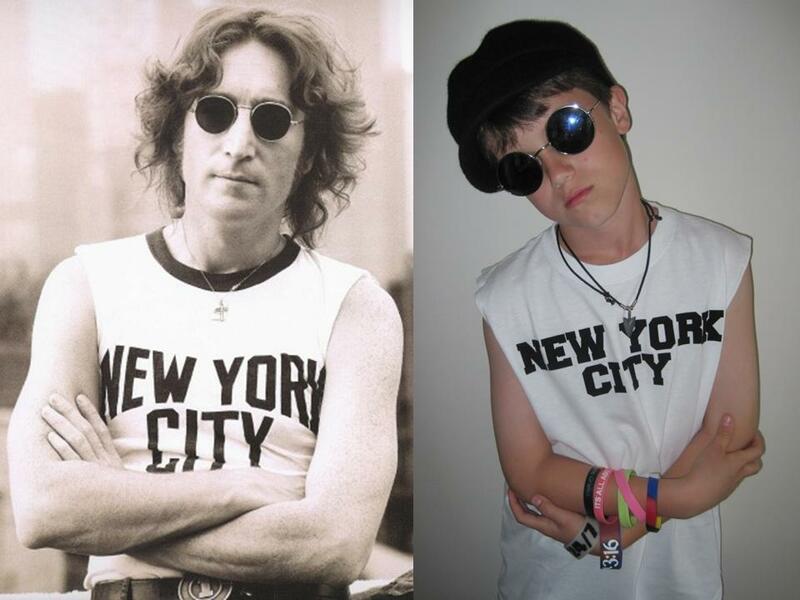 But recently my ten-year old son came home from school with a project that brought the Beatles back into focus. Together we researched the band, their history, their ride to fame, and their music. Hey Jude walked back into my life. After a particularly long day, with the kids finally in bed and a disastrous kitchen mess waiting for me, I searched YouTube for Hey Jude. I played it over and over! In the quiet of that night, as I was getting ready to CLOSE DOWN my kitchen, I played it just one more time–for me. It is the perfect way to cap off an evening and I finally know why…Hey Jude is soothing enough to change the course of a night, thoughtful enough to make you appreciate everything going on around you, profound enough to wake you up to life’s blessings, and long enough (7 minutes) that when it’s finally done, you’re really ready to say goodnight. Most friendships don’t span a decade, let alone three and counting. Some can’t believe it when I tell them, others say we’re lucky, and still some might wonder how we’ve managed to stay in touch for so long. All I really know is that I couldn’t ask for a better friend. We’re truly blessed to have each other! Today is Amy’s birthday. I can’t really remember the exact circumstances that brought us together. We met in kindergarten and the way we tell the story is that we were the two shyest girls in the class and that was a good enough reason to start up a friendship. I remember Amy’s long blonde hair and her quiet voice. 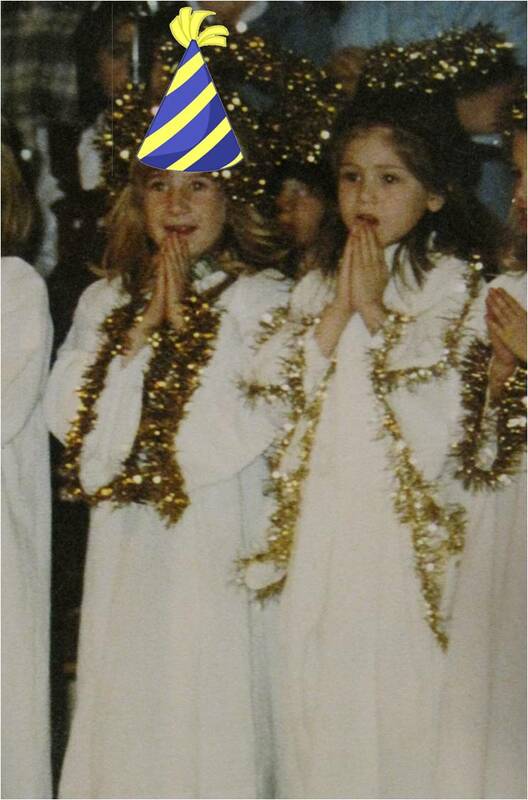 Her mother managed to snap a photo of the two of us side by side in the Christmas program…and we’ve probably taken hundreds of photos together (sans the angel outfits) since then. The details escape me, but I image we had a funny little friendship in the beginning…if you’re the shy type, this might resonate with you. I have grade school memories of sitting next to each other (not really talking, we were shy remember), softly laughing together and of course, playing “mystery” on the playground… but not much else. Fortunately, our friendship became a lot more animated in junior high–passing notes, trying to arrange classes together, going to the movies, dreaming about driving and staying over at each other’s houses. Eventually, her family became my family and vice versa. Thinking about afternoons at her house reminds me of putting Chex mix inside sandwiches, munching Cool Ranch Doritos, avoiding her cat (my parents were dog people so cats were totally new to me) and the awesomest (is that a word?) phone in the world–it was CLEAR! Amy was so cool! Today…solving the world’s problems over coffee! And alas, we graduated high school and moved away to college. We chose two different universities (approximately an hour away from one another) and the fun continued, but on a less frequent basis unfortunately. I loved visiting Amy and she likewise. We maintained communication via phone (no cell phones or text messages back in those stone ages!) Her friends became my friends and my friends hers. And the discussions continued… about boys, teachers, classes and now–OUR FUTURES. Amy had big plans for us to study in Europe–her in France, me in Spain. I on the other hand wanted to adhere to a four-year college schedule and find a job ASAP! We both stuck to our plans and still managed to stay connected despite being an ocean apart. I loved hearing about her adventures overseas. Her new friends, college life abroad, and the French lifestyle. Amy traveled and in some ways I felt like I was going along for the ride. A terrific pen pal, I received loads of postcards and photos. Through it all our tiny, Kansas hometown remained our connecting point. When we couldn’t see each other during visits home, we often ran into each other’s parents or siblings. One of my brothers would tell me that they saw her with her sister and that she hadn’t changed a bit. I, likewise, loved running into her family and asking how she was doing and when her next visit would be. Our friendship eventually moved bi-coastal with me on the west coast and her living on the east. Still, she made the trip out to San Francisco to be the maid of honor in my wedding and I wouldn’t have had it any other way. As I write this I can’t help but smile. There’s so many stories I could relay, so many memories that I wish I could share and there just aren’t enough pages for me to tell you all the things I love about Amy. Her kind heart, her loyalty, her fun-loving nature, her sharp mind, her perspective, her ambition, her courage, her faith and the list goes on. I know that I wouldn’t be who I am if I hadn’t met my yellow-haired friend all those years ago. Amy always says that we live parallel lives, and it’s my favorite phrase to describe our friendship–and “Amyism” if you will. 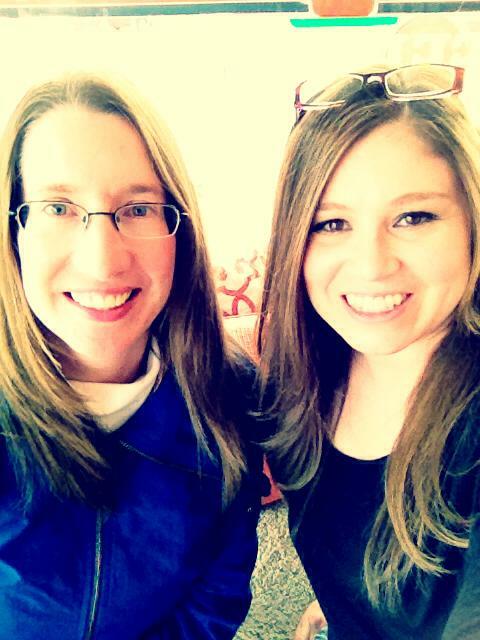 Today we still live hours apart (but both in the Midwest) and visit each other whenever we can. Our life paths have crossed, intersected, gone off in different directions and yet, whenever we get together it’s like no time has passed at all. I LOVE that! In many ways, life has changed and moved in directions that neither of us ever would have (could have) anticipated. And in other ways, we’re the same little girls who met all those years ago in kindergarten. Except that now, while we both maintain our “shyness,” if and when we get the chance to sit together, we can easily talk to each other for hours and hours… only the laughter between us today is much, much louder! Happy birthday to my dearest friend, YOU ARE LOVED!